As part of the National Institutes of Health (NIH)-sponsored Glucosamine/Chondroitin sulfate Arthritis Intervention Trial (GAIT) our objective here was to examine (1) the pharmacokinetics (PK) of glucosamine (GlcN) and chondroitin sulfate (CS) when taken separately or in combination as a single dose in normal individuals (n=29) and (2) the PK of GlcN and CS when taken as a single dose after 3 months daily dosing with GlcN, CS or GlcN+CS, in patients with symptomatic knee pain (n=28). The concentration of GlcN in the circulation was determined by established fluorophore-assisted carbohydrate electrophoresis (FACE) methods. The hydrodynamic size and disaccharide composition of CS chains in the circulation and dosage samples was determined by Superose 6 chromatography and FACE. We show that circulating levels of CS in human plasma are about 20μg/ml. Most significantly, the endogenous concentration and CS disaccharide composition were not detectably altered by ingestion of CS, when the CS was taken alone or in combination with GlcN. On the other hand, the Cmax (single-dose study) and AUC values (multiple-dose study) for ingested GlcN were significantly reduced by combination dosing with CS, relative to GlcN dosing alone. We conclude that pain relief perceived following ingestion of CS probably does not depend on simultaneous or prior intake of GlcN. Further, such effects on joint pain, if present, probably do not result from ingested CS reaching the joint space but may result from changes in cellular activities in the gut lining or in the liver, where concentrations of ingested CS, or its breakdown products, could be substantially elevated following oral ingestion. Moreover, since combined dosing of GlcN with CS was found to reduce the plasma levels seen with GlcN dosing alone, any improved pain relief by combination dosing cannot be explained by higher circulating concentrations of GlcN. Impact of long-term potassium citrate therapy on urinary profiles and recurrent stone formation. J Urol. 2009 Mar;181(3):1145-50. Robinson MR, Leitao VA, Haleblian GE, Scales CD Jr, Chandrashekar A, Pierre SA, Preminger GM. Comprehensive Kidney Stone Center, Division of Urologic Surgery, Duke University Medical Center, Durham, North Carolina, USA. PURPOSE: Potassium citrate therapy has become one of the cornerstones of medical stone management. We elucidated the long-term effects of potassium citrate on urinary metabolic profiles and its impact on stone formation rates. MATERIALS AND METHODS: We performed a retrospective cohort study in patients treated at the Comprehensive Kidney Stone Center at our institution between 2000 and 2006. Patients with pre-therapy and post-therapy 24-hour urinary profiles available who remained on potassium citrate for at least 6 months were included in the analysis. RESULTS: Of the 1,480 patients with 24-hour urinary profiles 503 met study inclusion criteria. Mean therapy duration was 41 months (range 6 to 168). Overall a significant and durable change in urinary metabolic profiles was noted as soon as 6 months after the onset of therapy. These changes included increased urinary pH (5.90 to 6.46, p <0.0001) and increased urinary citrate (470 to 700 mg a day, p <0.0001). The stone formation rate also significantly decreased after the initiation of potassium citrate from 1.89 to 0.46 stones per year (p <0.0001). There was a 68% remission rate and a 93% decrease in the stone formation rate. CONCLUSIONS: Potassium citrate provides a significant alkali and citraturic response during short-term and long-term therapy with the change in urinary metabolic profiles sustained as long as 14 years of treatment. Moreover, long-term potassium citrate significantly decreases the stone formation rate, confirming its usefulness in patients with recurrent nephrolithiasis. Les anti-oxydants retardent-ils la récupération ? TEIXEIRA, VITOR H.; VALENTE, HUGO F.; CASAL, SUSANA I.; MARQUES, A. FRANKLIM; MOREIRA, PEDRO A. Purpose: This study aimed to determine the effects of 4 wk of antioxidants (AOX) supplementation on exercise-induced lipid peroxidation, muscle damage, and inflammation in kayakers. Methods: Subjects (n = 20) were randomly assigned to receive a placebo (PLA) or an AOX capsule (AOX; 272 mg of α-tocopherol, 400 mg of vitamin C, 30 mg of β-carotene, 2 mg of lutein, 400 μg of selenium, 30 mg of zinc, and 600 mg of magnesium). Blood samples were collected at rest and 15 min after a 1000-m kayak race, both before and after the supplementation period, for analysis of α-tocopherol, α-carotene, β-carotene, lycopene, lutein plus zeaxanthin, vitamin C, uric acid, total AOX status (TAS), thiobarbituric reactive acid substances (TBARS) and interleukin-6 (IL-6) levels, and creatine kinase (CK), superoxide dismutase (SOD), glutathione reductase (Gr), and glutathione peroxidase (GPx) activities. Results: With supplementation, plasma α-tocopherol (P = 0.003) and β-carotene (P = 0.007) augmented significantly in the AOX group. IL-6 (exercise, P = 0.039), TBARS (exercise, P < 0.001), and uric acid (exercise, P = 0.032) increased significantly in response to the exercise regardless of treatment group. Cortisol level raised more from pre- to postsupplementation period in the PLA group (time × supplementation, P = 0.002). Although TAS declined after exercise before intervention, it increased above preexercise values after the 4-wk period in the AOX group (supplementation × time × exercise, P = 0.034). CK increased after exercise in both groups (exercise effect, P < 0.001) and decreased from week 0 to week 4 more markedly in the PLA group (supplementation × time, P = 0.049). Conclusions: AOX supplementation does not offer protection against exercise-induced lipid peroxidation and inflammation and may hinder the recovery of muscle damage. Pour dire qu’un aliment contient des oméga-3, il doit renfermer 40 mg d’EPA + DHA par 100 g (en fait, une larme). S’il en contient le double, le produit peut être qualifié de riche en oméga-3, du pigeonnage industriel quoi. 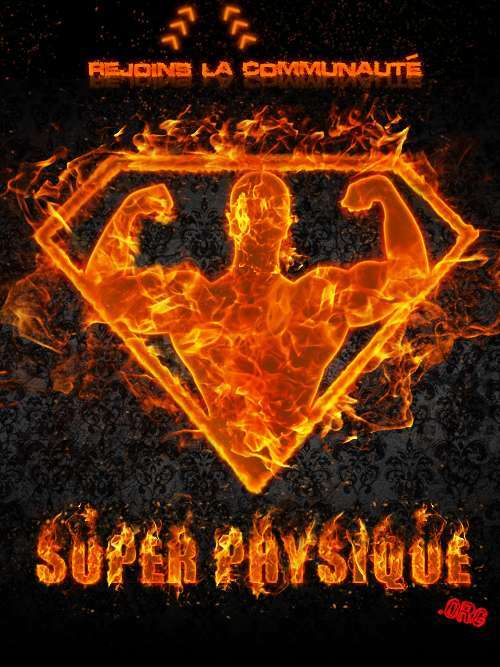 Chez des hommes non-entraînés, une cure de 8 semaines de créatine (0,05g par kg après charge) augmente de 50 % l’inhibition de la production de myostatine induite par la musculation. Par contre, la créatine n’a pas d’influence sur le niveau de GASP-1 (un bloqueur naturel de myostatine). may explain the increased muscle mass that is amplified by creatine supplementation. Cette étude montre le rôle essentiel du NO pour la masse musculaire, pour le force et contre la fatigue. Mais quand est-ce que plus de NO devient trop de NO ? Millions of Americans use dietary supplements with little knowledge about their benefits or risks. We examined associations of various herbal/specialty supplements with lung and colorectal cancer risk. Men and women, 50 to 76 years, in the VITamins And Lifestyle cohort completed a 24-page baseline questionnaire that captured duration (years) and frequency (days per week) of use of commonly used herbal/specialty supplements. Dose was not assessed due to the lack of accurate potency information. Supplement exposure was categorized as ‘‘no use’’ or ‘‘any use’’ over the previous 10 years. Hazard ratios (HR) were estimated by multivariate Cox regression models. Incident lung (n = 665) and colorectal cancers (n = 428) were obtained from the Surveillance, Epidemiology, and End Results cancer registry. Any use of glucosamine and chondroitin, which have anti-inflammatory properties, over the previous 10 years, was associated with significantly lower lung cancer risk: HR 0.74 [95% confidence interval (95% CI), 0.58-0.94] and HR 0.72 (95% CI, 0.54-0.96) and colorectal cancer risk: HR 0.73 (95% CI, 0.54-0.98) and HR 0.65 (95% CI, 0.45-0.93),respectively.